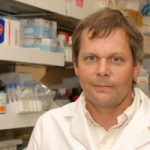 Eric Hoffman, PhD earned his PhD in Genetics at Johns Hopkins University and then pursued post-doctoral training with Louis Kunkel at Boston Children’s Hospital working on Duchenne muscular dystrophy gene and protein identification. Dr. Hoffman’s research has focused on molecular genetics, pathogenesis, and therapeutics of neuromuscular disease. The research group he directs at Children’s Hospital in DC hosts research laboratories of about research faculty, with a focus on ‘omics applications to pediatric health problems. Dr. Hoffman’s research group focuses on development of therapeutics for Duchenne muscular dystrophy. Relevant to drug development, Dr. Hoffman has co-founded ReveraGen Biopharma, where a novel anti-inflammatory, VBP15, is being developed muscular dystrophy and other disorders. VBP15 development is funded by Foundation to Eradicate Duchenne (FED), the NIH TRND program, and Muscular Dystrophy Association Venture Philanthropy (MDA VP). Dr. Hoffman develops systemic oligonucleotide therapeutics (exon skipping), in collaboration with Sarepta and other academic laboratories, and co-directs NIH-funded centers in Pediatric Pharmacology and Research Translation on this topic. Dr. Hoffman serves a Scientific Director of the 24 site Cooperative International Neuromuscular Research Group (CINRG), and is PI of a NIH National Center for Medical Rehabilitation Research (NCMRR). Dr. Hoffman is board-certified by the American Board of Medical Genetics in Clinical Molecular Genetics.